Brooks Cascadia 10 are neutral trail running shoes. The Brooks Cascadia 10 is the last update from one of the most beloved saga among neutral trail runners. Popularity is based on great blend of stability and cushioning making it a perfect choice for long runs. This new version improves traction from its predecessor Cascadia 9 on technical terrains by making outsole lugs smaller around the rim and redesigning multi-directional lugs along the edges. In addition, a revised 4 point pivot posting system in the midsole provides extra support on tricky terrain without feeling intrusive. 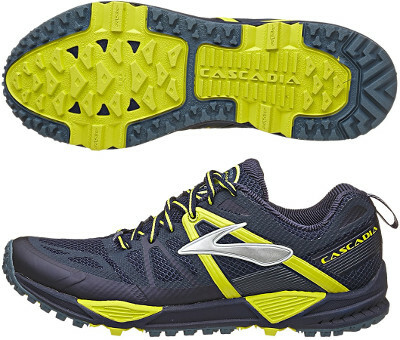 The Cascadia 10 takes advantage of latest midsole cushioning technology from Brooks already used in popular models like the Ravenna 6: adaptive BioMoGo DNA that continuously adjusts for a softer, more responsive ride. Heel strikers enjoy extra support thanks to full length segmented crash pad for smooth transition. Foot is protected with a ballistic rock shield and a reinforced toe cap. New upper is based on a breathable seamless mesh and also features asymmetrical design with midfoot supportive webbing to lock the foot in place and prevent it from moving around inside the shoe during trail runs.